This is my last update for 2016 (the chronological year, not the academic year), so you will not now hear from me again until the Spring Term 2016/17. As most of you know, the transferring of Statements of SEN to Education, Health & Care (‘EHC’) plans, which started when the new SEN Framework came into effect in September 2014, is due to be completed by 1 April 2018. So we are now more than half way through the process. Earlier this year (in April 2016) the DfE set up a dedicated website entitled ‘EHCP Journeys’, which has a number of resources for people producing EHC plans, such as to find out how to support parents and young people through the EHC process and including checklists to rate and improve delivery. “This website shows the EHC process from the perspective of families and aims to support areas to improve local services. I am also aware that the Council for Disabled Children (CDC) has been working on an EHC plan project (together with the Independent Support Programme and the DfE’s SEND Advisor Team) to identify examples of best practice in EHC assessment/plans from across the country. ​I believe that this is coming very soon and will be on the CDC resources page imminently. 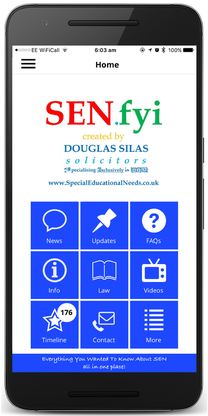 If you are a regular reader of my updates, you may recall that in my last SEN update for Autumn Term 2016/17, I launched a new free App called ‘SEN.fyi’, which provides SEN News, (these) Updates, FAQs, Info, Law and even (cartoon) videos. As I have said, I have tried to make ‘SEN.fyi’ as easy to use as possible. I am really delighted that so many people have contacted me (either directly, or indirectly through the survey I always have at the end of my updates) to say how much they are enjoying and using the App. I am very pleased that so many people have already downloaded and started using the App (I get statistics about this sort of thing I’m afraid!). But I thought I would use this section of my update to not only shamelessly plug the App, but to bring to your attention another feature it has, known as the ‘Timeline’, which I myself have been using very regularly and which I am finding extremely useful to know what is going on. This is because it provides the user with a timeline (hence its name) of everything that has been published recently that you are interested in (which you pick in ‘Settings’). You can then easily ‘Favourite’, ‘Share’ or ‘Search’ for things. As an example, I now almost routinely check the ‘News’ section of the App every morning (when I wake up) and evening (before I go to sleep) to see what is happening about SEN. I must admit that I am continually finding things out which would otherwise have passed me by. I either read articles/posts there and then (if I have time), or ‘Favourite’ them in order to quickly come back to later (if I don’t have time the time there and then), to keep up-to-date with issues that interest me and to mark them out for future reference (or ‘Share’ them with others quickly and easily). I can also ‘Search’ for particular words, to see what people have said about specific issues. Of course, this is just the way that I am using the SEN.fyi App, but as it is so helpful, I thought I would share this with you, in case it is also useful to you. You can download SEN.fyi (for free) through the Apple or Android App stores by clicking on the relevant image below. As always, I would be very grateful if you would only not only download it for yourself (if you haven't yet done so and I think it could help you), but also recommend it to others whom you think may benefit from having it. Let me first thank those of you who have contacted me (mainly through my surveys) after my last few SEN updates, where I have shared some of my (hopefully) humorous stories about was has happened to me as a disabled person using a wheelchair in recent years. I was particularly touched by comments about my last story: ‘If I Fall, Will You Catch Me?’ – about my falling out of my wheelchair once when I hit a bump in the pavement (on just one of many occasions), including one comment from someone who said that they found it to be ‘heart-warming’. Given the fact that most of the responses I receive are anonymous, it really means something to me to know that I am now also touching people on an emotional level, not just a legal or educational level. 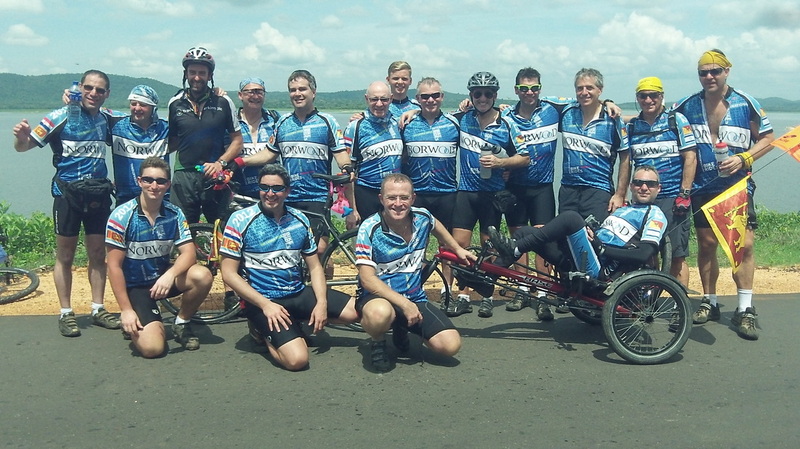 So I am going to share another funny story with you in this update about what happened to me once. A few years ago, my wife (Erica) and I were staying with some people in a hotel overnight for professional purposes; where its open-plan restaurant/breakfast area was slightly sunken on a lower floor a few steps below the ground floor, which you could see clearly from the reception level. As I could not access it easily in my wheelchair, unlike the others who could just walk down the few steps to it, I had to go around the breakfast area and down a long corridor by myself where staff had told me that I could access it via a ‘platform’ lift (a ‘platform’ lift is a more lightweight lift which buildings can put in place more easily than a fully-blown traditional lift and helps people avoid using the stairs between different floors or levels – you also need to keep the floor/level button pushed down until you arrive otherwise you stop moving). The ‘platform’ lift was contained in a ‘shaft’ like a normal lift, but with hinged glass doors, although it only needed to travel a few metres. My diversion took me a few extra minutes to negotiate (by which time Erica and the others had been seated at a table where they could see the lift, waiting for me to arrive and join them) and I managed to call it up successfully (it must have been used previously by someone to get down to the restaurant/breakfast level – probably by staff taking something down and then coming up again via the stairs as, if it was another wheelchair-user, I am not sure how they had got back up again and I hadn’t spotted anyone other than me that morning using a wheelchair?). I got into the lift alright by myself and then pushed (and held) the button in it, to allow me to go down. However, unfortunately the lift stopped working about half way down and, as the lower lift door which opened out onto the breakfast area was in glass, Erica and the others could then see that I was stuck, but could now only see my legs, seemingly dangling, behind the glass door! They must have thought at first that I had taken my hand off the button, so the lift had stopped moving. But, after a few minutes, when I appeared to be stuck there, they realised that something must be wrong and Erica came to ask me if I was alright; from outside the lift through the glass door, probably looking like she was speaking to just a pair of legs! When I told her that I was stuck, she summonsed assistance from a member of staff, who also then came over and spoke to my legs through the glass door! He told me that I needed to keep my hand on the button to make the lift move, as if I didn’t know this already, since I have been using ‘platform’ lifts for years and probably hundreds more times than he had ever used them! The problem was easily rectified by someone going to the top level and re-summonsing the lift, which allowed me to then successfully do the trip again and move between the floors (it actually only took about 15-20 seconds). But, unfortunately, it took staff quite a while to get the lift working again and get me down to meet the others in the breakfast area, by which time many people were now clearly aware that there had been a problem for me – the poor disabled guy! I am sure that Erica and the others thought nothing of it and have already forgotten about it, but I often think of that occasion, especially when I am using another ‘platform’ lift somewhere. See, some things that happen to me, whilst perhaps not amusing at the time, are often very funny to reflect on afterwards!